Also serving communities of South Elgin. There are 45 Assisted Living Facilities in the Elgin area, with 5 in Elgin and 40 nearby. The average cost of assisted living in Elgin is $4,625 per month. This is higher than the national median of $3,346. Cheaper nearby regions include Hoffman Estates with an average starting cost of $4,065. To help you with your search, browse the 385 reviews below for assisted living facilities in Elgin. On average, consumers rate assisted living in Elgin 4.4 out of 5 stars. Better rated regions include Streamwood with an average rating of 4.7 out of 5 stars. Caring.com has helped thousands of families find high-quality senior care. To speak with one of our Family Advisors about assisted living options and costs in Elgin, call (855) 863-8283. Promotion ends in 252 days! Elgin lies along the Fox River in the northern part of Illinois. With its proximity to the Chicago metro area, seniors in Elgin may benefit from the services and entertainment of the city. Seniors may also benefit from assistance with personal care and activities of daily living as provided in assisted living communities (ALF) in and near Elgin. There are over three dozen to choose from. Seniors living in assisted living facilities should know that all assisted living establishments in the state are regulated by the Illinois Department of Public Health (IDPH). The harsh climate of Elgin is a major deciding factor for most seniors. The city gets an average of 31 inches of snow per year and has a January low temperature of 14 degrees Fahrenheit. This is definitely not the place for seniors who prefer a warm climate. Another drawback of Elgin is the high cost of living. With a cost of living index of 103.3, the city is higher than the state and national averages. It is, however, 6.0 lower than the cost of living index for the Chicago metro area. Seniors should feel fairly safe in Elgin. With a violent crime rate of 17.4, the city ranks 13.7 below the U.S. average. Elgin also has a lower violent crime rate than the state of Illinois and the Chicago-Napierville-Elgin Metro Area. The property crime rate in Elgin is lower than that of the Chicago metro area and the U.S. average but is slightly higher than the state of Illinois. The air quality in Elgin is rated 67 out of 100, which is better than the national average. This is important for seniors who suffer from asthma, COPD or other respiratory illnesses. The Elgin area is home to world-class medical facilities, including Presence Saint Joseph Hospital and Advocate Sherman Hospital, in the event of medical emergencies or illness. Elgin has an array of community resources for seniors, including the Greater Elgin Senior Center on Grove Avenue, an organization that offers an assortment of recreational and educational programs, along with health monitoring services, such as regular blood pressure screenings. Assisted Living costs in Elgin start around $4,625 per month on average, while the nationwide average cost of assisted living is $4,000 per month, according to the latest figures from Genworth’s Cost of Care Survey. It’s important to note that assisted living rates in Elgin and the surrounding suburbs can vary widely based on factors such as location, the level of care needed, apartment size and the types of amenities offered at each community. 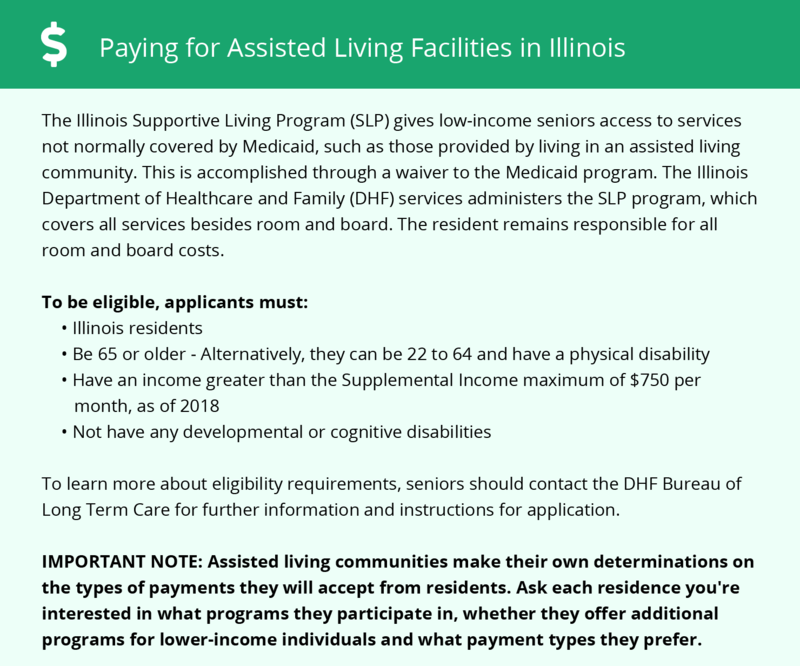 Illinois Medicaid does not pay for assisted living services. There are two waiver programs, however, that can offer financial assistance for residents of assisted living facilities. The Medicaid 1915(b) Waiver Program, called the Supported Living Program, and the 1915(c) Waiver Program, called the Managed Long-Term Services Fan Supports Program, provide help for seniors who qualify. Elgin and the surrounding area are home to numerous government agencies and non-profit organizations offering help for seniors searching for or currently residing in an assisted living community. These organizations can also provide assistance in a number of other eldercare services such as geriatric care management, elder law advice, estate planning, finding home care and health and wellness programs. To see a list of free assisted living resources in Elgin, please visit our Assisted Living in Illinois page. Elgin-area assisted living communities must adhere to the comprehensive set of state laws and regulations that all assisted living communities in Illinois are required to follow. Visit our Assisted Living in Illinois page for more information about these laws.